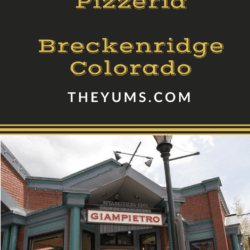 Just off the main drag in Breckenridge, Giampietro Pizzeria is the perfect place when you get that craving for a slice of New York-style Pizza. Not in the mood for pizza? No problem – Giampietro offers a wide assortment of salads, pasta dishes, meats and cheeses, sandwiches, entrees, and other selections on their extensive menu. Menu: Giampietro has a long, varied menu. Start with Appetizers like Marinated Olive Plate, Mussels, Calamari, or the Soup of the Day. Or try one of their many salad choices, like the Beet Salad with Arugula and the Italian Cobb Salad with Grilled Chicken. How about an Italian Cobb Salad with grilled chicken, pancetta, gorgonzola, tomato, cucumber, egg, pepperoncini, and red wine vinaigrette? Or try the Italian Sausage and Peppers Sub, or the Tettuccini Bolognese. Or maybe indulge in the Chicken Marsala or Veal Saltimbocca? With so many choices, there is something for everyone. No wonder Giampietro has been feeding hungry faces in Breckenridge since 1963. They also carry Cheeses, including Taleggio and Aged Goat, and Cured meats like Prosciutto Di Parma, Capicola, and Mortadella. Sandwiches include the tasty Meatball Parmesan Sub, Italian Sausage and Peppers Sub, and Hot Italian Beef. Even with all of the other choices, the star of the show is their delicious New York Style Pizza. Toppings include traditional options like Pepperoni, Meatball, Ham, Italian Sausage Green Bell Pepper, Onions, as well as Jalapeno, Pineapple, Broccoli, Peperoncini, Eggplant, Artichoke, and Ricotta. In addition to their outstanding pizza, other main dishes include huge Calzones, perfect for sharing – stuffed with Mozzarella and Ricotta and served with a side of Marinara. Or choose large portions of their flavorful Pasta dishes like the Fettuccini Bolognese, Penne Arrabiatta, and Linguine and Clams. Entrees include Chicken Parmigiana, Chicken Marsala, and Veal Saltimbocca. Finish off your meals with their wonderful desserts like the scrumptious Cannoli and Tiramisu. Price: Salads and sandwiches are $6-14 and entrees are $10-24. Pizza is $14.50 for a 16-inch cheese, plus $2.25 for traditional toppings and $3-3.50 for specialty toppings. Thoughts: My first thought when looking at the menu was, wow, this place has a whole lot more than pizza. While there were certainly lots of folks enjoying a slice of pie, many diners could also be seen enjoying salads, sandwiches, pasta, meats, and cheeses. Plenty of options make this a popular place. Pizza, yes, but also lots of other great choices. I saw a wide variety of clientele. Couples, families, and larger groups came to enjoy Giampietro’s casual atmosphere, friendly service, and great food. Portions are large. Pizza slices, calzones, pasta dishes, and subs are substantial, and you might consider sharing or taking home leftovers for a midnight snack. I found the prices for the quality and quantity of food to be very reasonable for Breckenridge. Sometimes, after a long day of skiing, hiking, biking, or browsing about town, visitors just want to grab something to take back to their hotel. Giampietro also offers items to go, which makes it very convenient to pick up and return to your lodging where you can relax and eat at your leisure. There are so many great reasons to visit Breckenridge. World class skiing. Hiking and biking trails. Beautiful scenery around every corner. A calm, peaceful atmosphere where you can exercise, relax and rejuvenate. And a foodie scene second to none. 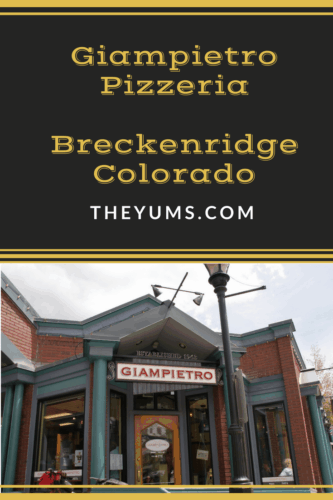 If you haven’t already done so, add Giampietro Pizzeria to your list of things to do in Breckenridge. They just put a pie in the oven for you. Get it while it’s hot! The author received a complimentary meal at Giampietro Pizzeria.